Chef Mick Brown and Ernie the Smoking Frog with DIY Solar BBQ Pot Smoker. Yes- I am aware that some bad stuff is happening to really good people, all around the world. Be that as it may… you have to drive something. Right? Plus, we could all use a ZEV [Zero Emission Vehicle] to help others. For example, I hope you’ll meet me at the American Cancer Society (ACS) “Relay For Life” Rally at Griffith Park on May 20th. I’ll do Cooking Demonstrations and sales of HEROIC! will be donated to ACS and the new BBQ RESCUES! Foundation. I also plan to volunteer at the Celiac Foundation Expo on June 3rd in Pasadena, CA. Why shouldn’t I arrive in one of the planet’s most environmentally friendly vehicles? One problem for Tesla is that the they are outpacing available ZEV Credits in California. It’s almost like the State is saying “Ok- You’ve done enough for Clean Air. Now go back to making Gas Guzzlers.” I hope they come out with a solar powered Car Battery soon, to free up more ZEVS. Tesla recently partnered with Solar City, so they can help Golden State customers take advantage of existing CSI Bonuses (no Crime Scene Investigations- it means California Solar Initiatives). This will save money on Home Energy Bills that you can use to pay for your Tesla. 1. Fuel Efficiency- Yeah, the $1000+ monthly Lease could get a bit steep. But think of all the Gas Money I’ll save… Even more affordable if Tesla will Donate a car to the Foundation. 2. 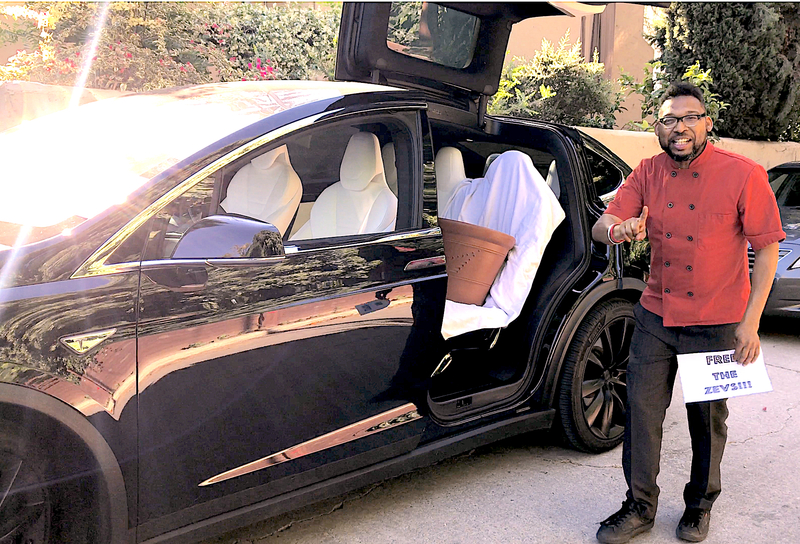 Long Distance Trips- If you live within 10,000 Miles of California, I will gladly drive my Tesla Model X to your Private Lesson, Catered Affair, Lecture, Expo, Bat Mitzvah or and other occasion. Put #TeslaForMick (hashtag) on your Social Media and I will let you take a free Selfie, or a ride in “our” new Tesla, as time permits. 3. No Waiting List Please-It hurts my heart to hear about those of you with cash money, who have to wait months for the delivery of the Tesla of your Dreams. [I lose sleep over this sometimes]. BBQ Season has started. May is National BBQ Month. So I need a Tesla Model X now. I’m not picky- I will accept a Tesla Model X Donation of Any Color, Seat Type, Tinted Windows or not. Even a used one with gentle mileage will suffice… Ship It! 4. I’m Old- That’s right. I occasionally get carded because a 22 year old Cashier thinks that I’m Millennial. Heading South of 50 years, my eyes and feet grow tired after a long day of Catering Parties and Charity Events. Today, the Median Average Salary of a full-time Chauffer is over $32,000/year. Using the Model X’s self-driving features will help save money and allow me to rest my tired aching feet. Maybe even catch some sleep while on the Highway. [Yes I went there. JUST KIDDING!]. 5. With the help of Tesla, and Solar City we can Save The Planet- with the World’s 1st DIY Solar BBQ Flower Pot Smoker. [Yes the DIY Smoker is back and better than ever.] Could you imagine replacing every Charcoal, Gas, Propane and Pellet Grill with Solar Power? In can happen… [See Video]. Smoking Chicken on DIY Solar BBQ Pot Smoker. Courtesy of www.bbqrescues.com. Look- the lease on the Silver Beast SUV that I have been driving for the past couple of years is about to expire. What Private Grilling Lesson Client or BBQ Party Guest wouldn’t appreciate that their food has been transported in a ZEV? I’d appreciate the Free Trip to New York if I win the Tesla/Solar City #ProjectLoveday Contest. But what I really need is a new Model X I can drive for “Research” while we create affordable Solar BBQ Smokers for everyone. Remember, promote #TeslaForMick and I hope to see you on the road soon.